This marinade is suitable for fish or chicken. 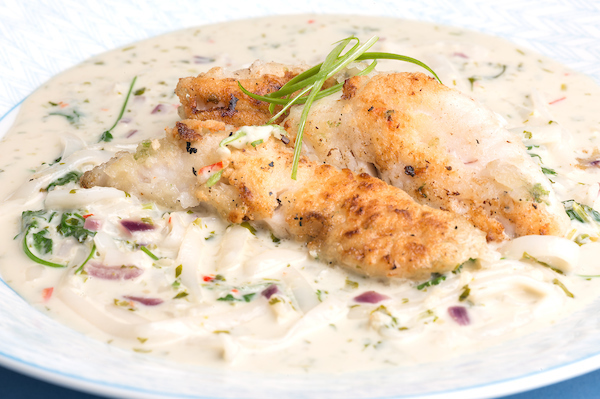 TIP: We tossed our fish fillets in cornflour and pan fried them in oil. While they were cooking, we heated the marinade and cooked rice noodles in the marinade to their packet directions. Coriander leaves were mixed in just before serving. The fish was served on top of the noodle-marinade mixture. Peel the onion and chop finely. Mix all the ingredients together in a dish suitable for marinating in or a snaplock bag. Add the chicken or fish and refrigerate for 8 hours or overnight. . Drain the fish or chicken and cook as required. If serving the marinade, bring to the boil and simmer for 5 minutes before serving. DO NOT serve without heating. We tossed our fish fillets in cornflour and pan fried them in oil. While they were cooking, we heated the marinade and cooked rice noodles in the marinade to their packet directions. Coriander leaves were mixed in just before serving. The fish was served on top of the noodle-marinade mixture.